The first burial in the Cambridge Cemetery at Hautapu was Robert Wilson on 25 June 1866. In January 1876, J H Smith, W B Morgan, James Runciman, John Martyn Jnr and John Shaw were elected to the Hautapu School committee. In March 1877, the teacher, Rev McLaurin opened the school on the corner of Hamilton and Pickering Roads. In 1884 the school was moved to a new site on Hamilton Road four miles from Cambridge and finally in 1910 a new school was built in a more central position on land acquired from the Duncan brothers. Subsequently the school was enlarged in 1918; a teacher’s residence was built in 1926 and more ground acquired; a swimming pool was provided in 1946-47; and an additional classroom in 1953. 5 August 1884 there was a meeting at Cambridge to start a cheese factory and by October 1884 building had started on Jared Allwill’s land near the proposed railway line. 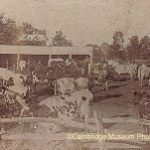 On 20 December 1884 the first milk was received and processed by the Cambridge Produce & Dairy Factory which was established at a cost of £1,466. By 1886 Cambridge had run into difficulties with milk supply and the factory at Hautapu was taken over by George Watt and James Hally. Butter and cheese were made and a bacon factory was added. At the beginning of the 1900s numerous co-operative dairy companies had been formed throughout the country. Watt and Hally’s factory at Hautapu was not big enough to take the milk from the newly established dairy farms which evolved from the large estates being cut up for closer settlement. The Cambridge Co-operative Dairy Company (incorporated 17 July 1901) bought Watt and Hallys factory for £2,068 and was promised the milk from 1,000 cows. On 3 September 1908 a new brick factory was built at Hautapu for £1,890 8s. There was a switch to cheese manufacture in 1915. In 1919 the New Zealand Co-operative Dairy Co Ltd was formed absorbing the NZ Dairy Association, the Thames Valley Dairy Co. and the Waikato Dairy Co. This factory is now owned by Fonterra.